Remember me talking about I Love Lamp? 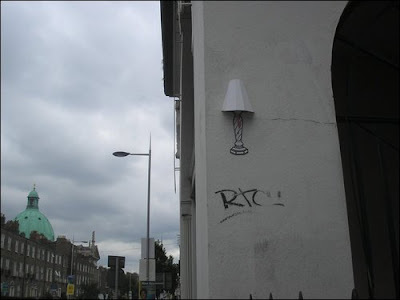 Will Knott mentioned it as well, and now Dublin Streets have just blogged about the new 3D versions. Do you have a "formal" background in art: (IADT, Ballyfermot or similar)? No, but I attended computer classes for the elderly. Why the interest in street art? Street Art is free, fun and for everyone to see. You dont have to go to a gallery to see it, just walk to the shops or whatever. It's all around you. What was the inspiration to do stickers in the first place? The stickers came after the posters. How did you get them printed and how much did they cost? Cost is irrelevant. Just brightening up people's day is important. 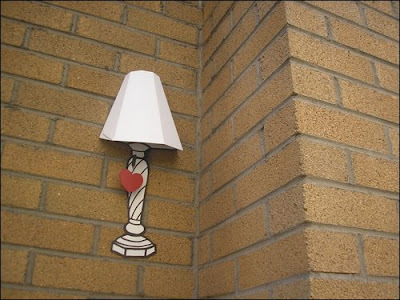 Where was the first I love Lamp sticker put up? Cannot for the life of me remember. I remember the first poster was put up late August 2007, maybe the 25th, somewhere in Dublin 8. Is the I love lamp scene your favourite scene in Anchorman? I've seen it - it's a good scene but the whole film is hilarious. It's only the starting point. 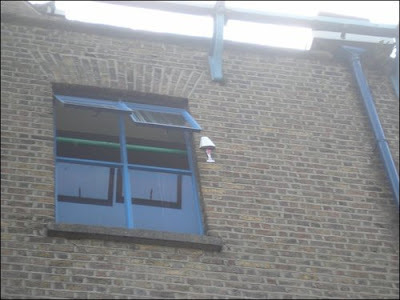 I just thought it was a fun idea, putting pictures of lamps in boarded up windows. Making something ugly looking beautiful. And now it's gotten slightly out of hand. How many helpers (if any) do you have for sticking up the stickers? My Lampettes cannot be counted. They are a mysterious force that keeps growing stronger every day. 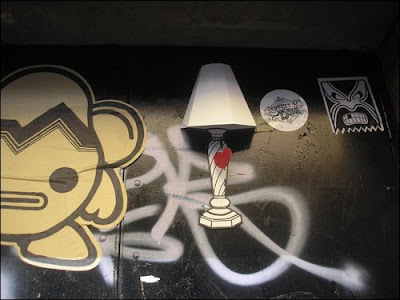 What's your favourite Lamp Sticker photo you've seen or had submitted? What's the most unusual place you've seen one of the stickers? They are all in unusual places, because they are all in places where they shouldn't be. Are you going to do a website or a blog? I'm unsure about a website - I'm happy with the power of Bebo and MySpace at the moment. Maybe in the future. Are their new ideas in store for your fans? The style has evolved, there will be new photos posted soon. Madscone82 has some great shots on Flickr, as does Lints who has been very helpful. How could people help you if they wanted to? Just keep sharing the love cause I like making people happy. Finally, have you any suggestions for young people who may have an idea for a cool project? Just do it. Simple as that! What do you think? Art or graffiti? 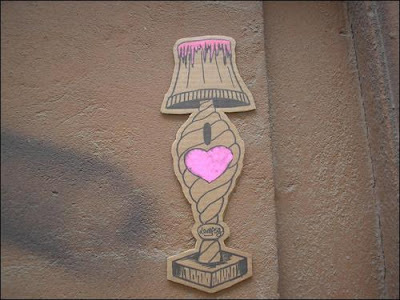 Do you love lamp? 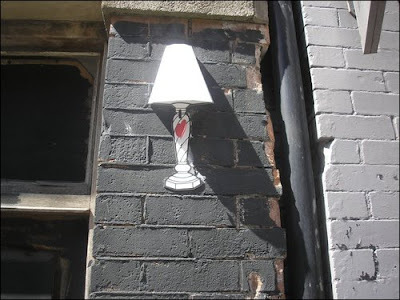 I do love lamp. Lots of stickers in my neighbourhood and they never fail to make me smile! Haven't seen a 3D one yet though. Haven't seen any of these in the wild. 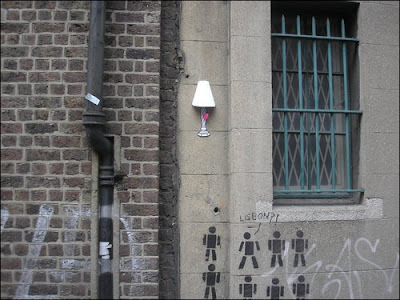 I love lamp. Hey - We are jealous of the selection you have of the 3D ones - we are defo going on a hunt for them ourselves now! oh i do love lamp. though that is a definite lack of 3D ones in my life, i'll have to look harder.